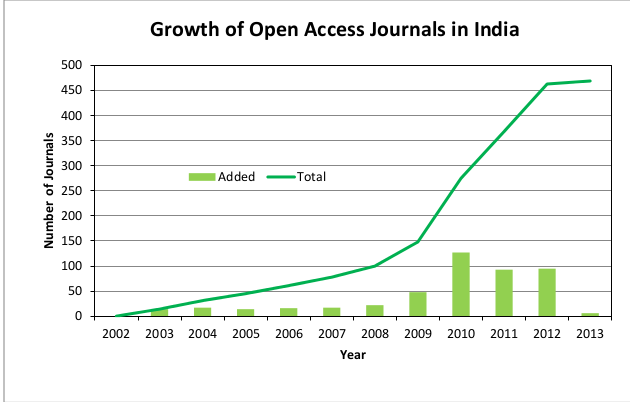 This post is about the growth of Open Access Journals in India with more emphasis on agriculture and allied subjects. We can see that immediately after Budapest Open Access Initiative (2002), the Indian Academy of Sciences made all its journals Open Access. To this list Medknow also added few of its journals and till the year 2005 only medical journals were added to the DOAJ. From 2005-06, other subject journals were also listed in the directory. Only during 2007, the first agricultural journal which was added is Journal of Tropical Agriculture which is the official publication of Kerala Agricultural University. In 2008, NISCAIR added its journals and from agriculture, the ICRISAT‘s Journal of SAT Agricultural Research, Madras Agricultural Journal from MASU. The year of 2010 has the highest number of journals added to the directory in which Open Access Journal of Medicinal and Aromatic Plants is the first journal to be added from a scholarly society housed at an ICAR institute. And in 2012, Indian Phytopathology is another journal to be added from the scholarly society housed at an ICAR institute. However, there are other Open Access journals like Indian Journal of Agricultural Sciences, Indian Journal of Animal Sciences which are ICAR publications hosted at e-pubs platform of ICAR and Karnataka Journal of Agricultural Sciences, Indian Journal of Fisheries etc which are not added into the directory. Hope they would soon be added for the benefit of public good. It’s good to note that India ranks 4th in the world in list of Open Access journals after United States, Brazil and United Kingdom.